Service Costs > How Much Does Urban Air Cost? How Much Does Urban Air Cost? 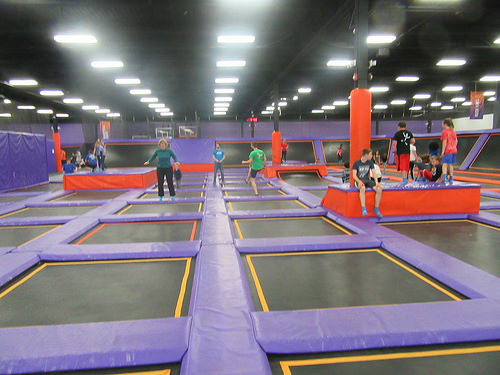 Urban Air, an indoor amusement park facility, has multiple locations throughout the United States, each with its own attractions, ranging from wall-to-wall trampolines to trampoline beds. These family fun parks, spanning more than 25,000 square feet, provide a unique experience for children (and adults) of all ages. The costs to attend Urban Air will greatly depend on the location, the age of the jumper, how long they are jumping, and the time of the day as some functions can, oftentimes, increase the price. From what researched, the average price was about $10 to $15 per hour for an “All Access Pass,” but during some promotions, the costs could be much less. As for parents, the costs at most locations, from what we read, were $5 each to jump. Aside from the hourly rate, you will also have to pay an additional $2 to $3 for a pair of trampoline-approved socks. Keep in mind that some facilities may have additional features, which will cost an additional price. This can include non-trampoline attractions such as the Warrior Course, TUBES playground, ropes course and sky rider to name a few. Talk to your local location to see if separate tickets are needed to use these attractions. The Apex – The Apex area allows you to bounce off of the wall with the dozens of trampolines on the floors and the walls the Apex provides. Climbing Wall – The climbing wall attraction offers the thrill of climbing and taking on new challenges. With multiple walls available, each unique feature allows you to climb from one to the next. Dropzone Air Bag – This area allows you to practice any stunts and tricks, where you will land on a supersoft, safe landing zone. Foam Pit – This gigantic foam pit allows you to perform any trick or flip, all while landing on a padded, cushiony foam balls. Free Style Open Jump – As the name notates, this open area arena allows you to simply bounce around on the trampolines. Indoor Playground – The indoor playground attraction, designed for children younger than nine, is designed to offer a diverse playground experience — indoors. The Runway – Great for either the gymnast or tumbler, the runway allows you to practice for the next competition. 7 & Under Area – As the name proclaims, this jumping area is designed for children younger than seven. Slam Dunk – Practice any dunk you may have witnessed online, launching yourself from a slam dunk track. Ultimate Dodgeball – Combining regular dodgeball and trampolines, this creates a unique dodgeball experience. Pick-up games are held daily at locations and all ages are welcome. Ultimate Battle Beam – The warrior battle beam allows you to battle friends in the ultimate fitness area, where you can test your strength and balance on the balance beam. As all locations are franchised owned, the discounts will vary, but from what we saw online, some locations did provide military discounts. Some locations offered discounts/offers by following the “coupons” page beneath the “hours and pricing” menu title on the official website. Check out Groupon.com as the gym has advertised on this daily deals website in the past.